Sleeping bags littered the newsroom. Mattresses lined conference room floors. A tent was erected in a far-off corner. "We told people if they had nowhere to go, to come here," Rick Hirsch, managing editor of the Herald, told CNNMoney. "If you intend to bring a pet, the official policy was don't talk to me about it." Housed in the former headquarters of the US Southern Command, the Herald newsroom is perhaps one of the safest places in the Miami area to ride out Hurricane Irma. The walls are built of concrete. The windows are bulletproof, designed to withstand an impact as forceful as an RPG blast. Four heavy-duty backup generators could power the building and printing press for up to 10 days in the event electricity were go to out. And the building is connected to the Internet through four different service providers, all but ensuring the newsroom will remain online through the powerful storm. Herald journalists, well aware of the building's ruggedness, chose to take advantage of the fact that they work in a literal fortress. 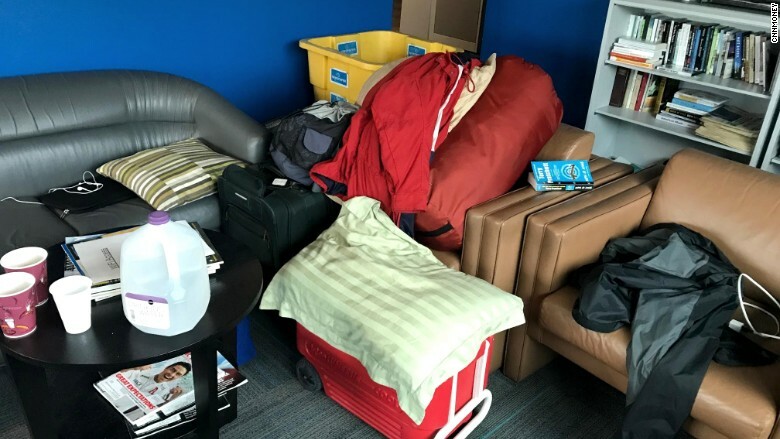 In total, about 30 staffers and their families streamed into the newsroom on Friday night and Saturday morning, looking for a safe place to work and stay for the duration of the storm. By late Saturday afternoon, blankets littered the office space. Families occupied vacant rooms. Children passed time playing video games. That's not to say work wasn't getting done. The newsroom was fully staffed and provided its readers with 'round-the-clock coverage of Hurricane Irma. But having family close by and safe certainly helped ease the nerves of journalists providing their community the latest updates on the hurricane's path and the damage it could do to their city. "Last year with [Hurricane] Matthew he had to come to work and I stayed at home," said Danielle Guillette, who was staying at the Herald while her fiancée Nick Nehamas, a Herald reporter, worked to cover the storm. "It's nice to be here with him. I'm glad the Herald is welcoming families in." Nehamas, who told CNNMoney the two planned to stay at the Herald until Monday when the storm passed, said he enjoyed the family-centric atmosphere. "I think everybody is glad for the company," Nehamas said. "It's nice to have people who are not reporters around to keep us sane." Antonio Delgado, who has been with the Herald for 18 years, said sleeping this weekend at the office was "part of the job." "We're covering the storm. We are covering the news," he said. For the times he wasn't working, Delgado brought a tent, which he set up in a spare room. It "offers a little bit more privacy," he said. 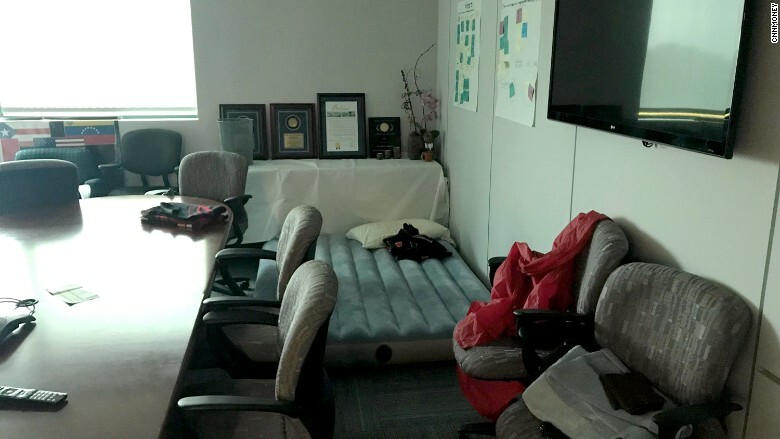 Even reporters from other news outlets, including NPR and The New York Times, chose to hunker down in the Herald's newsroom as Irma battered the state with high winds, pounding rain, and dangerous storm surge. Frances Robles, a reporter for the Times, told CNNMoney she had been looking for a place to stay in the Miami area after covering Hurricane Irma in Puerto Rico. "I came back and didn't have a plan. Everyone I knew had evacuated. And I was in this panicked moment where I thought, 'Oh my gosh. I don't have anywhere to go,'" Robles said. "I used to work at the Miami Herald. So I thought to myself, 'What would I have done then?' Well, I would have gone to the Herald. So then it was like 'bing' when I remembered there was a place that would have generators, air mattresses, bathrooms, and stuff like that." The Herald relocated to its new office building in 2013. 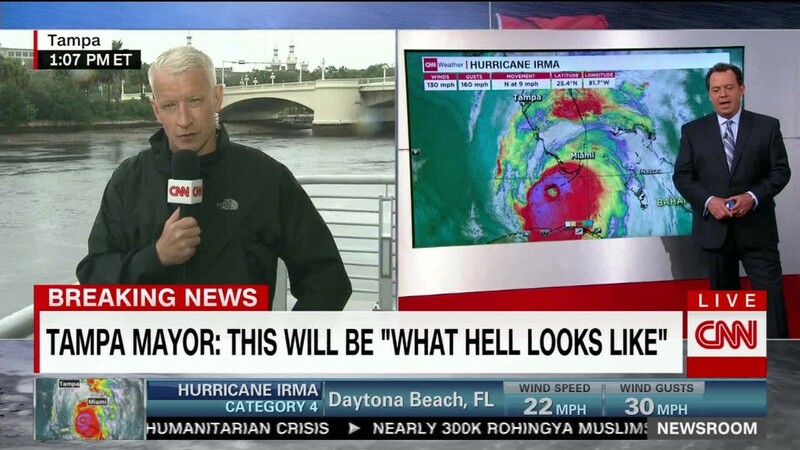 Aminda Marqués Gonzalez, executive editor of the Herald, told CNNMoney that when the newspaper was scouting the area for office space, the ghost of Hurricane Andrew was in the back of everyone's mind. During Hurricane Andrew, Marqués Gonzalez lost everything. So did Hirsch. Both have personal, vivid memories of the destruction a powerful hurricane can cause -- and they wanted to make sure the publisher selected a newsroom that was housed in a building strong enough to keep the paper running and providing its community with potentially life-saving information if another were to hit Miami. "When we got this place, a huge part of the consideration was a place that we could continue to print the newspaper and publish digitally," Marqués Gonzalez said. "We've never not published in print. And we want to keep that streak going. It's been more than 100 years." Correction: An earlier version of this article misspelled the last name of Herald reporter Nick Nehamas.